To help you get there, let’s break down what the FAFSA is, as well as what information your clients will need to be prepared to provide. To apply for aid, students must submit the FAFSA, which is the application used to determine eligibility for federal aid programs, such as grants, work-study, and loans. The schools that students apply to will also use the FAFSA to determine whether additional aid is available from the state and from the school itself. The application asks students to provide a considerable amount of personal information, such as marital and citizenship status, tax- and income-related information, household size, and the schools they will be applying to, as well as details about their parents’ income, assets, and education history. Please note: Many private colleges and universities require other aid applications in addition to the FAFSA. The most common of these is the CSS Profile®. Parents can check with the school’s financial aid office to determine which applications are required. The role of tax returns. Information from the student’s and parents’ tax returns is used to complete the FAFSA’s income-related questions. Due to a recent change, there is now a two-year lag when completing income questions on the FAFSA. This means that a family completing the 2019–2020 FAFSA would use information from its 2017 (often referred to as the prior-prior year) tax returns. Therefore, tax returns filed in the student’s junior and senior year will not affect aid awards. One of the primary reasons why the FAFSA requires so much detailed information is because that data is used to calculate each student’s expected family contribution (EFC). The EFC is a measure that determines how much federal aid a family may receive. The EFC formula considers parental assets and income; student assets and income; and other factors, such as the number of family members attending college at the same time. Many people believe, incorrectly, that the EFC is the amount of money the family is expected to contribute to education costs. In truth, the EFC is simply a number used by educational institutions to determine if federal aid is available and, if so, how much. Parental assets. The questions the FAFSA asks about parental assets pertain to ownership interest at the time the application is completed. Reportable parental assets include cash and funds held in bank accounts, trust funds, 529 accounts, and more. Parental assets are considered low-impact assets for financial aid purposes: up to 5.64 percent of the value of parental assets will affect the EFC. Student assets. Student assets include property for which student has an ownership interest at the time the FAFSA is completed. UTMA/UGMA accounts, for example, fall into this category. Custodial 529 accounts and 529 accounts owned by the student are not considered assets of the student and should be listed as parental assets. 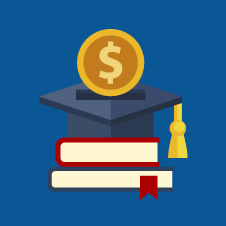 Student assets are considered high-impact assets for financial aid purposes: up to 20 percent of the value of student assets will affect the EFC. Protected assets. Some assets are protected and do not need to be listed on the FAFSA, including 401(k)s, pension plans, 403(b)s, IRAs, and other retirement plans. Equity in a family’s primary residence, certain family-owned businesses and farms, life insurance, annuities, and personal possessions are also nonreportable. If your clients’ children are approaching college age, it may be helpful for them to get an estimate of the family’s EFC. The Department of Education’s FAFSA4caster is a free calculator that can be used to create an estimate of financial aid eligibility. What About Grandparent-Owned 529 Plans? Because assets owned outside of the immediate family are not included on the FAFSA, often, grandparents will own 529 plans for the benefit of the student. While this may make sense in certain cases, there are some details to consider before moving forward with this strategy. Funds in a grandparent-owned 529 plan are not considered countable assets on the FAFSA, but money that’s taken out of the 529 plan and used to pay for education expenses is considered nontaxable income to the student. Distributions from a grandparent-owned 529 plan will reduce eligibility for need-based aid by as much as 50 percent of the amount of the distribution. So, if your client’s parents do own a 529 plan for the benefit of the child, they may want to consider reserving those funds for the last two years of college, as the FAFSA uses the prior-prior year’s tax return to complete the income questions. The FAFSA is complicated for many parents and students. Fortunately, you can point them to a number of resources to help them complete it. One of the best is the Notes section at the end of the FAFSA itself. There are more than 100 questions on the FAFSA, and the Notes section provides helpful information on some of the trickier ones. Additional resources include the Federal Student Aid website’s robust FAQs page, as well as a live chat feature and other contact information for questions and assistance. Whether they’re parents, grandparents, or younger investors who are thinking about starting a family, discussing college funding with your clients can be an unexpected value-add. If you aren’t already doing so, consider expanding your service menu to offer education planning on a consulting basis. You’ll set your firm up as a resource providing much-needed guidance and solutions to individuals at every stage of their financial journey. What questions tend to come up when discussing college funding with your clients? How have you helped your clients through the process of determining their financial aid eligibility? Please share your thoughts with us below.